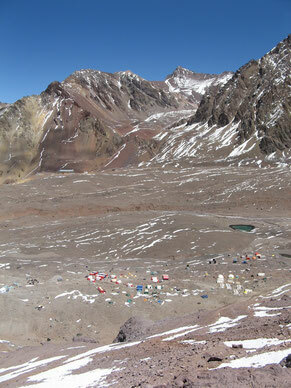 The most visited base camp in the Aconcagua Provincial Park is Plaza de Mulas. From there the majority of expeditions start to summit via the Normal route. Plaza Argentina is the second option to summit Aconcagua via the Polish Glacier or False Polish Glacier route. It is also very scenic to ascent via Plaza Argentina and to descent via Plaza de Mulas, the so called 360 degrees route. See more options at the section How to climb. 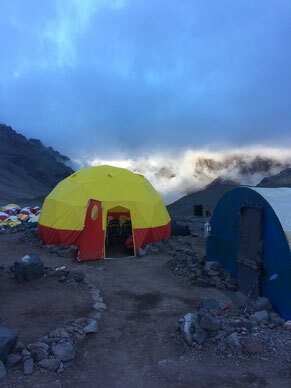 If you choose the Normal route you will stop at Camp Confluencia to get acclimatized and to do the day-trip to the famous South Face of Aconcagua. 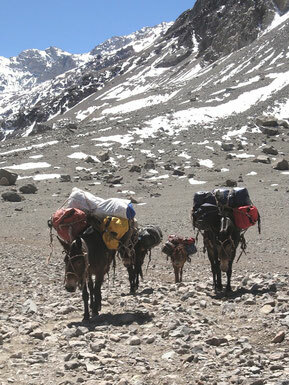 Mules played always a very important role in the history of Aconcagua. All the loads of the Mountaineers and supplies for the camps are transported on those strong animals. The mules are handle by the so called 'Arrieros', strong, hard working men. They ensure that the loads get delivered safely and the animals won't be harmed. The healthiness of our our animals has always first priority for us. We have our own Mules, based in Puente de Inca, during the climbing season. Off-season we give them a rest in lower altitude. In the season we can provide you luggage transport to all three base camps, Confluencia, Plaza de Mulas and Plaza Argentina. All logistics can be done for you. In our office, conveniently located in the heart of the city centre of Mendoza, we coordinate and assist you. We combine you what you need. You can combine those services up to your needs. Setup your own group! With a minimum of 2 person you can also get a fully guided trip for a reasonable price! This maximizes your chance to summit! We are Aconcagua Experts! Ask us! We can provide you also with logistics services for other Mountains in the Andes. We are operating from our base in Mendoza and can organize your trip according to your needs. You can also book yourself into a fully guided trip. Ask us for more information! Take a look at our Offers as well!